Recently I came across an e-book that synthesizes well the core message of my presentation. 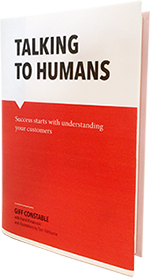 This book written by Giff Constable is called Talking to Humans. I encourage you to read this book. You can download it for free. As stated Steve Blank, entrepreneur and author of The Startup Owner’s Manual. Categories: Design, Mobile, Presentations | Permalink.